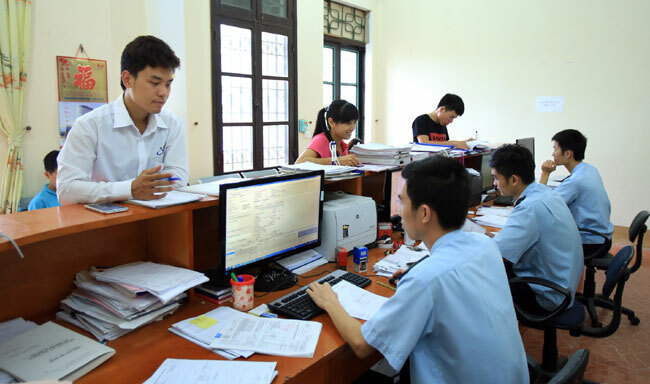 HA NOI (VNS) — The application of information technology was one of the key reforms needed for the administration of taxation and customs. This was stated at the 2015 Vietnam Finance Conference, which opened in Ha Noi yesterday. Time and costs spent on completing procedures in taxation and customs had already been significantly reduced thanks to a series of measures promoting administrative reform, including the application of IT in tax and customs management, said Deputy Minister of Finance Tran Van Hieu. Online tax filing was implemented by 63 out of 64 localities nationwide. And more than 600 local tax departments and all customs agencies nationwide applied electronic customs procedures for import-export products, he said. "These efforts contributed to improving the business environment, national competitiveness and efficiency of State management," he said. Apart from promoting IT application, the ministry also reviewed all legal documents and procedures to cut inappropriate administrative procedures to reduce burdensome for businesses. Deputy Director of Viet Nam's General Department of Customs, Nguyen Cong Binh, said IT has been widely applied in administrative reforms, including customs, import-export tax collection, risk management and examination after customs clearance. He said the reforms had brought tangible benefits to businesses as well as enhancing the effectiveness and efficiency of State management over customs. He added that they had helped shorten the time of customs clearances, reduced paperwork, simplified business records, and reduced inspections and the need for supervision. Binh said the application of the automated customs clearance system (VNACCS/VCIS) and single-window system marked an important milestone in the process of reform and development of the customs service. So far the system had been implemented at all 34 local customs departments nationwide. More than 99.65 per cent of export declarations are now completed through VNACCS. In the first year of implementation (from April, 2014, to March, 2015), a total of 56,000 companies filed declarations via the system. Customs monitoring is done by electronic methods, which helps reducing congestion at port gates. The customs sector technically connected with the ASEAN-one door policy from September 8. The present time for customs clearance of goods has, on average, fallen from 21 days to 14 days for exports and 13 days for imports. This helped reduce 10-20 per cent of the costs as well as 30 per cent of clearance time for businesses. The technological solutions have helped cut compliance costs by VND705 billion ($31.2 million) per year for import and export businesses, Binh said. Deputy Head of the Tax General Department, Nguyen Dai Tri, said IT application was considered a key foundation in all steps of tax management, from tax registration, tax filing and tax payment. Positive signs had been recorded in the field of taxation, he said, adding that more than 510,000 businesses had electronic tax filing at present, accounting for 98 per cent, and more than 25 million online records. The time required to pay taxes for each business was cut by 370 hours to 167 hours per year from early this year. The country targets to reduce taxpaying hours to 121.5 hours by the end of this year. Export tax payments were now done automatically through the exchange of information on budget and revenues between customs and commercial banks, Tri said. However, participants said infrastructure, equipment and transmission lines had not met all requirements for the deployment of electronic tax. Viet Nam Finance includes an exhibition showcasing the latest technology solutions, products and services for the finance industry.